I've had ombre hair for almost two years now, and I'm still not bored of it. I go through the odd phase of wanting to go completely blonde, or completely dark, but in all honesty I love ombre hair, and I think I'll be keeping it for a long time yet. People are constantly asking me how to do it, wether they stop me on the street, at work or on a night out. Now instead of giving them the complete break down of how I did it myself, I can simply recommend these dye kits to them. I'm kind of surprised that it's taken a company this long to catch onto the trend and release these kits, but many people will be pleased to know that these are available to buy now. They actually look pretty good too! They come with a plastic brush to apply the bleach, which I assume will make it much easier to apply and easier to be more precise with application. They also come in three different shades. 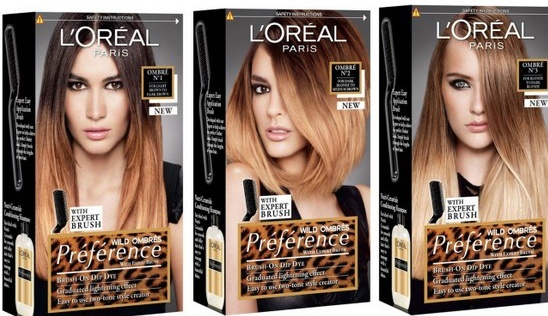 I might buy one of these to use when I top up my ombre... it has grown out quite a lot now! Oh MY..need to check if they're available in Italy or on Ebay! Definitely going to try these! I had ombre hair at the start of the year and think I want it again! !